All Supplementary Admission Applicants are invited and expected to be present for the screening. Any candidate/applicant who missed the first and second batch screening for cogent reasons can come for the screening. Candidates/applicants should come with the original of their credentials and other supporting documents. The Anambra State Polytechnic, Mgbakwu ANSPOLY 2017/2018 Admission Application has been extended for Supplementary Admission Application into its National Diploma ND Programmes, Higher National Diploma HND Programmes and Preliminary /Remedial Studies Pre-ND Programme. The sale of the Supplementary Admission Application Form starts Thursday, 1st February, 2018 and ends/closes on Wednesday, 14th February, 2018. The bank online payment and Polytechnic online registration portal will be open for the application during the approved extension period. ND and HND prospective candidates who missed the first and second batch application period can now use this golden opportunity to apply to the Polytechnic of the Moment. 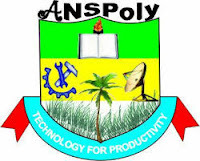 Those who do not have JAMB UTME result and/or who are deficient in core O Level SSCE results also have the opportunity to apply for ANSPOLY Pre-ND admission. Pay for the form online using e-tranzact payment platform at any commercial bank nationwide and register online at the Polytechnic Website www.anscoam.edu.ng at any cyber cafe or at the Polytechnic ICT Center. Please, read the advert post details below for the complete information on the available courses and method of application. Rush now while the offer lasts as there may not be any other opportunity. Call 08036043706 or 08141141638 or 08038901211.